In the 2016/17 cocoa season, the European Cocoa industry ground over a million tons of cocoa beans, close to a third of the world cocoa production, with the Netherlands alone accounting for 550.000 tons, which makes it the second most important processor of cocoa beans in the world, closely following Côte d’Ivoire. Downstream, the Dutch cocoa trade and cocoa-processing industries together handle one million tons of Cocoa products. Other major European players in the cocoa trade and processing are Germany, the United Kingdom and France . Some chocolate factories still grind cocoa beans themselves. Others buy cocoa mass from the cocoa press industries. But in all cases the factories purchase the extra cocoa butter needed to make chocolate. By far the greatest part of the cocoa mass is processed into cocoa butter and cocoa powder. World-wide, the annual trade of cocoa butter exceeds 800,000 tons on average. In Europe, the most important exporters are the Netherlands and France; the top buyers are Germany, Belgium, the Netherlands and France. 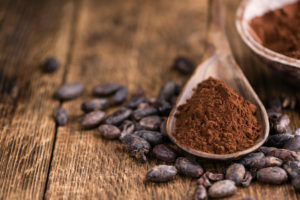 The Netherlands is the world’s market leader for cocoa powder with an export share of about 35%. Major outlets are the United States, Germany, Spain, Russia, Belgium and France. In most European countries and the United States chocolate is legally protected as a product. 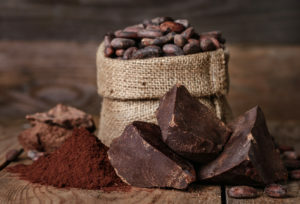 The minimum percentage of solid cocoa ingredients is determined by law. European Directive 2000/36/EC only allows the addition of up to 5% of vegetable fats other than cocoa butter in the weight of the end product. Should this percentage be above 5%, the product may not be called chocolate.